It blazes through an empty space. It illuminates the surrounding environment. It runs free through the land, burning with courage and vitality. Yet, like a fire soon to be extinguished, its morale is dwindling, like a speck of ash falling from the sky. More and more, people march on with their lives with no intention but to survive for their own sake. Dreams fall into the wayside like lava sloping down a volcano, and the passion to strive to succeed slowly disappears into the darkness. To win the Passion of Fire, one must rekindle her own spirit and find a burning desire to succeed, regardless of the path she takes. After all, passion invokes many emotions, and they can either roam free like a wildfire or be still like a candleflame. To become Ruby is to burn with love, courage, loyalty and confidence like a dancing flame on a candlestick. Suiseiseki could be forgiven for feeling overlooked. Her win over C.C. secured her first career Saimoe Necklace, but her triumph was partially overlooked with the Haruhi-Tomoyo and Fate-Shana battles stealing her thunder. The good news is that the Gardener's match now has the full attention of the spotlight. The bad news is that the battle is against the ISML's Rookie of the Year, Taiga Aisaka. With every remaining match crucial to the fight for positioning in the double elimination tournament, both girls need a strong start to the Ruby period. Will the new Emerald Necklace bearer K.O. the Palmtop Tiger, or will she get caught by a "Taiga" Uppercut? As the old saying goes, there's no rest for the weary. Just hours ago, Aisaka Taiga fell to the suddenly-red-hot Emerald-Necklace-winner Suiseiseki. The loss knocked Taiga into a dangerous position, where a couple more defeats could push her out of the chase for the Tiara... much like her opponent today. Saber scored 43 wins in last season's campaign—good enough to secure a spot in ISML 2009, but a mere three wins short of a berth in the chase for the Tiara. The Knight has improved her ranking this season and only needs to gain a couple wins on the competition to get into the Top 10. But after suffering a tough loss to Izumi Konata, she's in a 4-way tie for 14th, and a losing streak could put her in serious danger of missing the double-elimination tourney completely. Which girl will right the ship and take a positive step towards the postseason? The KyoAni empire is as strong as ever, but the same can't be said for its God-Empress. At the end of the Emerald period, after running roughshod over an ISML-record 44 straight opponents, Suzumiya Haruhi tasted defeat at the hands of Sakagami Tomoyo. With her invincible aura gone and her fans shaken, she must regroup as she faces a challenger who is a surprise to say the least. Tōsaka Rin missed last year's postseason with a modest 41-22 record and began this year 9-6. Since then, she's been on fire, winning 31 of her last 32 to put herself in the thick of the battle for the Tiara. The bad news for Rin: two of her losses, including her only defeat during her current run, were to Haruhi's S.O.S. Brigade members. Will she extract revenge on their leader, or will Suzumiya complete the sweep and regain momentum? Last year, seven candidates literally held the top 7 spots in the overall standings virtually all year round, so much that then-8th seed Ichinose Kotomi was virtually nothing compared to the 7 that occupied the standings. Had it not been for Suigintou dropping only one match since Amethyst 1, we would have been stuck with the same seven candidates dominating the overall standings for a second year. Although the top 6 seeds from last year still hold the top 6 positions in the overall standings, Suigintou has a chance tonight to dethrone the 7th of the so-called Elite 7 of ISML 2008. Lately, Hiiragi Kagami has been in a downswing, and despite continually standing as a candidate very difficult to beat, she has yet to have an undefeated necklace period, which is very disappointing for a two-time ISML necklace winner. Her recent (7-2) Emerald performance compared to Suigintou's (9-0) resulted in Kagami relinquishing the 7th seed to Suigintou, and with the Mercury Lamp a favorite to win this match, Kagami's going to need to muster all the strength she has yet if she is to hang on with the other six candidates. A loss against Suigintou will not only be the final blow to her unofficial title as a member of the Elite 7 but will also send her to 9th place and out of the running for the Ruby necklace. Will Kagami successfully defend her position in the top 7 or will there finally be a changing of the guard that we have all been waiting for? Nanoha's favorite color may not be known, but we can assume it's not emerald green. Four of her ten losses came in the Emerald period, including three in the period's last four matches. The next time Takamachi Nanoha searches for a Jewel Seed, she may decide to leave it be if it looks anything like an emerald. Suiseiseki's opinion may differ slightly. Emerald was very kind to the timid doll, as she went 9-0 to win the Emerald Necklace. Even though it was her first perfect period, she's been far better as of late than last year's 36-27 record; She has won 25 of her last 26 (including her last 14), with only the then-perfect Haruhi able to knock her off. One may find it fitting that Suiseiseki's eyes are two different colors. With a necklace already in her possession to compliment her emerald-green left eye, could a compliment for her ruby-red right eye be DESU-tiny? At the dawn of the Ruby Period, both of these girls were within reach of the playoff bubble. 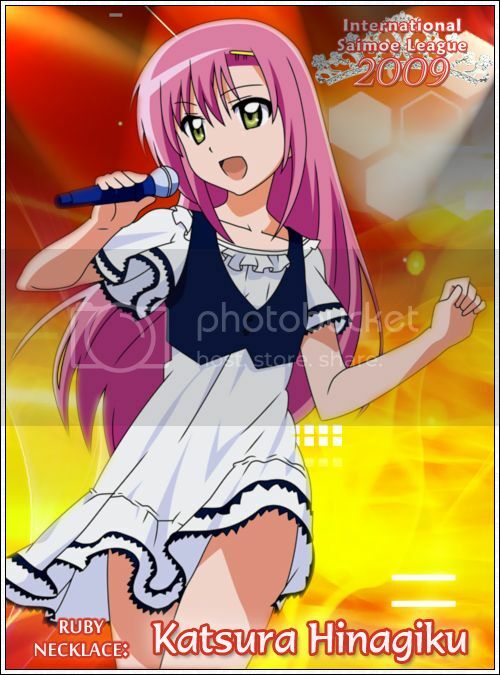 Izumi Konata was 15th, one win ahead of Katsura Hinagiku, who was in 17th place. With only 16 invites to the proverbial Big Dance, both of these athletic ladies are desperate for wins. Things have changed slightly, as both Konata and Hinagiku would be in the Tiara chase if the season ended today. Unfortunately for these two, the season does NOT end today, which means they'll have to complete the rest of their schedule; Before Ruby is over, each will face #11 Taiga, #12 Nahona, and a girl currently still in the fight for the #1 overall seed (Konata vs. Haruhi Suzumiya, Hinagiku vs. Tomoyo Sakagami). With the clock dwindling on the regular season, neither girl will have much time to recover from a misstep here. This is the definition of must-win. Thanks to amdrag and minhtam1638 for contributing match descriptions. Near the Top 16 cutoff line, we have a log jam. The girls ranked 12th through 17th are all within one win of each other, which makes every win important... and the recent fall of these two competitors all the more devastating. Saber may live as a servant, but the Ruby period may be the first time she's ever been truly "owned." She opened Ruby with a loss to Izumi Konata, and followed that up with a defeat at the hands of Aisaka Taiga. She was able to break that losing streak in her last match against Kirisame Marisa, but Marisa entered the battle at #49. Takamachi Nanoha may still be lyrical, but those lyrics may now need a Parental Advisory sticker. She started the season 32-6, but that seems like ancient history now. Nanoha has since gone 5-5, including a 500-vote thumping at the hands of Suiseiseki in Ruby 3. Which girl will finally get back to their old winning ways? Katsura Hinagiku enters this match riding a huge wave of momentum. She stands at 3-0 in Ruby aftertaking Izumi Konata to the proverbial woodshed and beating her by nearly 1,000 votes. With a Ruby 9 showdown with current #2 seed Sakagami Tomoyo looms on the horizon, a win today wouldn't make a perfect Ruby period inevitable... but it would become a posibility. Aisaka Taiga won't let that happen easily, as she has visions of success herself. The Palmtop Tiger was hoping to add a necklace to her all-but-clinched Rookie of the Year trophy, but thanks to a loss to Suiseiseki, the Ruby necklace is out of reach. But with momentum for the Diamond period and positioning for the Tiara chase still to be won, and matches against playoff contenders Izumi Konata, Suzumiya Haruhi, and today's match against Hinagiku, Taiga can still make a huge impact in Ruby. Furukawa Nagisa has a bad habit of being sick, and her ISML career hasn't been helping to combat that lately. It has been an absolute rollercoaster for CLANNAD's leading lady, as she has danced into and out of the Top 16 the last couple of weeks. She's far from alone, as she's one of six girls fighting for three playoff spots, all within one win of each other. And one win behind that group sits the hard-charging Shinku. Rozen Maiden's third-ranking contestant is 4-0 in a period for the first time this season, and she has won 13 of her last 14 overall--her only loss in that span at the hands of fellow doll Suiseiseki. Besides the hunt for the Ruby necklace, a win today would officially double her win total from last season, which all but assures her of being ISML's most-improved girl. Will she claim that honor today, or can Nagisa 'get well' against the demanding doll? Regardless of how things may play out in Saimoe battles, most would agree that if you create a list of the defining names of the KyoAni nation, Haruhi Suzumiya and Konata Izumi would be - in some order - 1a and 1b. Ranking them by popularity would be like ranking them by their ISML history: Extremely too close to call. Last season, both girls were in almost the same positions they are in now: Haruhi fighting for the overall #1 seed, Konata barely inside the Top 16. While the rankings predicted an easy win for the God-Empress, the voters would say otherwise, as they ended regulation in a draw. Haruhi won the match in overtime, but the message was delivered. When they met again in an elimination match in the postseason, it was Legendary Girl A who had the last laugh, as she defeated Haruhi by just one vote. Their odds of a fourth meeting coming in the Tiara tournament appear to be high. If the season ended today, this would be a first round match. Both girls are looking to make a statement, as Konata's 3-2 record in Ruby has seen her in danger of missing the Top 16, and Haruhi came within 13 votes of falling to unheralded Konjiki no Yami in Ruby 5. Today, the question isn't 'Who will win,' but rather 'Will we see yet another nailbiter?'. Suzumiya Haruhi and Izumi Konata may be the biggest rivalry match in this match set, but this matchup is the most important in regards to Ruby Necklace eligiblity. Last year, a Suiseiseki that was well-conditioned to winning single-elimination matches for three years struggled with ISML's round robin format in 2008, leading her to barely make the cut for this year's contest. This included a humiliating defeat to newcomer Sakagami Tomoyo among many other candidates, and it's taken Suiseiseki about 14 months since ISML 2008 to finally get used to the round-robin conditions. Now that the 2006 Korea-Japan dual champion has finally found a rhythm in ISML 2009, this match is looking up to the premise of glory and prestige, as the newly coronated Emerald Necklace bearer will come armed with her magical watering can against the sakuras of Aquamarine, and at stake is the honor of becoming the first - if not only - dual necklace winner of ISML 2009. Will Suiseiseki defeat arguably the most consistent ISML candidate of all time, earning necklaces that match the colors of her eyes, or will Tomoyo dethrone the most successful single-elimination Saimoe contestant and successfully combine fire with water? These two competitors may have a good excuse if 100% of their focus isn't on their opponent. Their attentions may also be devoted - for differing reasons - to the same girl: Suzumiya Haruhi. For Tōsaka Rin, it may be out of frustration. Seventy-two votes - just 2.3% of the total vote - was all that kept the sorcerer from scoring a season-altering victory over Suzumiya in Ruby 3. Although she won't get another crack at Haruhi, the sorcerer has another opportunity to change the complexion of the season today against the current #1 seed. Even though that #1 seed will have her hands full today, Shana may be thinking about Haruhi as well. With a win today, the stage will be set for a showdown between the two of them for not only the #1 seed, but possibly the Ruby necklace as well. The Flame Haze is also chasing history, as she enters the day on a 41-match winning streak. Sweeping the rest of Ruby would bring that total to 45, which would break the record of 44 set by... Suzumiya Haruhi. But thinking too much about the past or the future leads to disaster. Whichever girl can clear their minds of all but their match today will have the advantage. Which girl will it be? Lately, a lot of focus has shifted to the candidates that are close to making the top 16, and lately, the name Ichinose Kotomi has never surfaced in that discussion, until now. Quietly winning out of the spotlight as others in the top 16 continually lose, Kotomi is now right outside the door of the top 16, and a winning streak coupled by others' misteps can lead her right back into the thick of the things. And to add a cherry on top of the cream, she is still eligible for the Ruby necklace. Unfortunately, if she's going to have at least a better chance of making it, she'll have to dethrone the defending tiara winner. Fate Testarossa is just outside the top 4, and if standings stand as they are, she'll be facing her own best friend in the first round. Rather than having to face that, she's looking to move up to the top 4, and anybody who stands in the way, beware. And ironically, Fate has yet to win a necklace, but she can pick up a win and some crucial tiebreaker points by defeating Kotomi here. Will a musical upset shake the arena or will lightning finally strike on the violinist? The fans of Rozen Maiden's dolls and Suzumiya Haruhi no Yuutsu's S.O.S. Brigade are each fighting to send all three of their respective girls into the Tiara tournament. One group's wishes may very well come true at the expense of the other, which makes this match between each faction's third-place girl extremely important. Shinku started Ruby 3 wins outside of the Top 16, but a 5-0 record in the period (coming after an 8-1 run in Emerald) has helped her close that gap to one. A win today could put the demanding doll in a tie for the 16th spot and make her a favorite to end the season on the right side of the Top 16 cutoff line. Asahina Mikuru's Ruby hasn't been as kind as Shinku's. A 3-2 record has kept the time traveler in the hunt, but only by treading water. She needs to make a move, and today's match - along with her showdown with Nagato Yuki in Ruby 7 - will say alot about her chances to advance. We don't know who will win, but we do know that one faction's chances of having three girls chase the Tiara will get a boost today. Coming off a 9th-place finish in the Korea Best Moe tournament, Konjiki no Yami was a topic of quite a few conversations entering the ISML regular season. As she has struggled her way to a solid-if-unimpressive 31-20 record, those conversations have been few and far between. But in Ruby 5, the Golden Darkness almost became the talk of the town, falling just 13 votes short of upsetting #2 seed Suzumiya Haruhi. Now just a few days after almost pulling off the year's biggest upset, she faces the tall task of trying to pull off an even bigger one. Shana holds the overall #1 seed, but because of a relatively weak schedule, she's currently last among the eight girls who are undefeated in Ruby. A tougher final week means that if she can survive the final three matches, she can almost be assured of holding the Ruby necklace when all is said and done. Besides rankings and necklaces, both girls have something to fight for: A win for the Golden Darkness will qualify her for next year's ISML preliminaries, while the Flame Haze can officially clinch a Top 16 spot with a victory today. If Ruby has taught us anything, it's that potential fans of Suzumiya Haruhi should be free of any and all heart conditions. Ruby 3 saw the goddess edge Tosaka Rin by a meager 72 votes, and she followed that up in Ruby 5 with a 13-vote victory over the slightly-above-average Konjiki no Yami. Yes, she's still tied with Shana for the top spot. Yes, she's now 16-0 all-time in Ruby. Yes, she can still be all but assured of the Ruby necklace by winning her final two matches. But it has not been an easy journey, and it only gets harder today as she faces a girl with something to prove. Aisaka Taiga has been mighty impressive in her first major saimoe contest. At 42-10, she seems well on her way to a spot in the chase for the Tiara. But even with all that success, one thing has haunted her all season: She hasn't won the big one. She is 0-for-6 in matches against the ISML's Top 8. She needs to change that if she wants to be a threat in the double elimination tournament and with an apparently-vulnerable Haruhi standing in front of her, this seems like her best chance to do so. Can the Palmtop Tiger finally score the big win that's eluded her all season, or will the Brigade Leader 'super-drive' her way to yet another victory? It may all be coming apart for Suzumiya Haruhi. What seemed to be an era of dominance for the unbeknown goddess that generated talk of a possible undefeated campaign halted after her loss to Sakagami Tomoyo three weeks ago, setting a string of inexplicable close encounters to defeat - to out of double-elimination contenders nontheless - before finally giving way to a heartbreaking 25-vote upset to Aisaka Taiga. All of this, and her next opponent is a longtime rival that would give up almost everything (maybe not her crush) to win the Ruby necklace. Shana hasn't lost since almost forever; her lone defeat to Tomoyo (of all people) with Aquamarine at stake seemed so long ago that Shana is actually one win away from breaking this year's winning streak record set at 44 by Haruhi herself, and if deja vu shows its face tonight, Shana is in a perfect position to claim a win and set herself up to claim the Ruby Necklace if Katsura Hinagiku falls to Tomoyo tonight. However, Haruhi's recent downfall has left her in quite an unstable state of mind, and this could be the first time she could lose control entirely, making this match the one to watch for in this match set. Could Shana pull away with a victory and actually claim the Ruby necklace under circumstance, or will the goddess actually set the stage for Armageddon? For a girl afraid of heights, Katsura Hinagiku is riding pretty high right now. Hard-fought wins over Izumi Konata, Aisaka Taiga, and Takamachi Nanoha have helped propel the swordswoman to an 8-0 record in Ruby, and with as tough a schedule as she has faced, a win today may be enough to win the necklace, regardless of what happens in the other premiere matches. This is the third time this season (and fifth time in the last 12 months) that Hinagiku has entered the last match of the period 8-0, and she has ended all of those periods 8-1. To end her own streak, she'll also have to end another: the 29-match winning streak of Sakagami Tomoyo. Even though she's a longshot to add a Ruby necklace to her already-won Aquamarine, she's been absoloutely unstoppable. Her current run includes streak-ending wins over Fate Testarossa (who entered their match winning 14 in a row), Suiseiseki (17 in a row), and Suzumiya Haruhi (at the time 44-0). She enters this match knowing that a win coupled with a Shana loss will give her the overall #1 seed. Combine that with a penchant for big wins, and things look good for Tomoyo. But Hinagiku is a tenacious fighter, and you can never count out a tenacious fighter. Who will land the knockout blow today? This battle of the bookworms holds a lot more meaning than it did just a couple of days ago. Thanks to her upset of Suzumiya Haruhi yesterday, Aisaka Taiga gained quite a few fans yesterday, perhaps none bigger than - god bless Haruhi's soul - Nagato Yuki. Thanks to that loss, the Ruby necklace has gone from highly improbable to possible. If Haruhi bounces back to beat Shana and if Sakagami Tomoyo takes down Katsura Hinagiku, then the necklace will be up for grabs. Of course, we should know that no win is in the bag until the results are tallied, and all of this will be a moot point if she can't defeat Hiiragi Kagami. However, history favors the Data Interface (and Yuki might know a thing or two about history repeating itself). She scored two victories over Kagamin last year; once in the regular season and again in the loser's bracket to end Kagami's season. It should be noted, though, that the girl who sent Nagato to the loser's bracket in the first place was Kagami. Besides playing spoiler, a win for Kagami would even up the lifetime ISML series between the two girls as well as prevent her from suffering back-to-back losses for the first time this season. With so much suddenly at stake, you can bet that these two will go all out for victory today. Entering Ruby 6, the three Rozen Maiden dolls were a combined 15-0 and it looked like this match between Suiseiseki and Suigintou would decide which girl would win the show's third straight necklace. That day, many were surprised to see the dolls go 1-2, with Suigintou being the lone winner. Lately, Suigintou has been anything but "junk" as of late; convincing wins over Asahina Mikuru and Hiiragi Kagami have put her at the top of the performance ratings this period, but relatively poor performances from her opponents leave her a longshot to pair her Amethyst necklace with Ruby. Yet even without a necklace on the line, Suigintou still has something to fight for, as she'll hope to push her winning streak to 24 matches and keep Suiseiseki from starting a streak of her own. Although it raised some eyebrows, Suiseiseki's loss to #3 seed Sakagami Tomoyo in Ruby 6 was not a shock, but her recent loss a match set later to non-top 16 candidate Ibuki Fuko certaintly surprised many. Once a favorite to win Ruby, she now finds herself staring at a 6-3 necklace record, which would be her worst performance since her stumbles in Aquamarine and Topaz. To avoid that third loss, she must not let history repeat itself; last year, these two met in both the ISML regular season and the Korea Super Best Moe championship match. Both times, the Desu Doll was on the losing end. Buenos Aires, prepare for another Alice game. Can Suigintou make it a three-peat, or will Suiseiseki get back to her old winning ways? In most cases, winning 89% of your matches would be a good season. But coming off of last year's 60-3 performance, Fate Testarossa's 2009 season has been a little disappointing to her followers. The Enforcer, like her opponent today, is out of the running for the Ruby necklace... but that's not necessarily a bad thing. Fate won the Tiara last year without claiming a single necklace, and you can bet she'd give up the glory of a necklace for the right to retain her crown, as she has done before. Besides, she still has something to look forward to in this match: a chance to avenge one of her losses from last season. Last season in Aquamarine 8, Fujibayashi Kyō defeated Fate by a mere two votes. A win today wouldn't carry her to the necklace, as she was defeated in Ruby 3 by the same werewolf that kept her from winning Korea's Best Moe competition last year but today's victory should keep her (extremely slim) hopes of claiming the #1 seed alive. To see why that top spot is so important, look no further than last season and the girl who claimed that spot: the eventual champion, Fate Testarossa. Tonight, a rematch that will completely affect double-elimination seeding will commence, and you do not want to miss a rivalry rematch.